SS Rajamouli’s BAAHUBALI: THE BEGINNING is not only breaking box office records and is appealing film buffs around the globe but the movie has even caught the attention of none other but the Prime Minster of India Narendra Modi and the Home Minister Rajnath Singh as well. Both the Prime Minister and Home Minister have assured dashing and debonair Telugu actor Prabhas, to watch the film soon, when he met them in New Delhi. 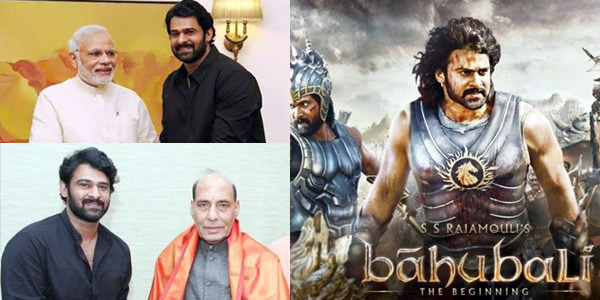 Prabhas sharing his pictures on social networking sites with Prime Minster of India Narendra Modi and the Home Minister Rajnath Singh expressed joy that despite their busy schedules both the Prime Minister and Home Minister welcomed him with grace and even expressed their desire to watch his film BAAHUBALI: THE BEGINNING. Apart from PM Modi, Prabhas also met Home Minister Rajnath Singh as well, who too seemed excited to watch the movie. In fact Rajnath Singh recently even shared a photograph of him with Prabhas on social network stating that he looked forward to watching the film. Interestingly though Salman Khan’s recent hit BAJRANGI BHAIJAAN is running successfully but it is stunning that BAAHUBALI, despite in its third week is giving a tough time to BAJRANGI BHAIJAAN. Trade reports claim BAAHUBALI is doing brisk business and is registering an average of 70% occupancy in the existing number of cinema halls across the globe. According to trade reports BAAHUBALI has crossed over Rs 400 Crore at the worldwide box office in 15 days. Incredible indeed! !